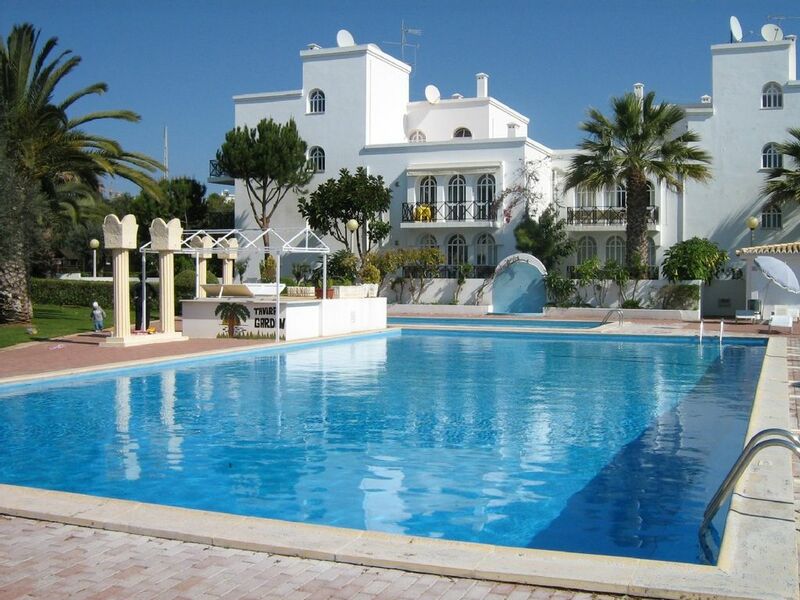 Spacious two bed apartment situated in a charming, luxurious complex with pools. Family friendly, self-catering rental, near the stunning beach of Ilha Tavira. *NEW* from Aug 2017 : We now have had our own Router installed. Wifi is available at £3 per night (charged for every night of your stay). Please let us know if you do not require internet access. The air-conditioning unit in the living room also has heat so is suitable for winter let. There is an iron and ironing board available (sorry can't provide someone to do it for you!!) There is ample free, safe parking right outside the apartment. Please note there may be a small charge for the use of the Tennis Courts (Racquets and Balls can be hired) and Gym. We have books to read, children's beach toys, sun shades, mats and a cool box and ice packs all available for use. The apartment was in many respects as advertised.However nobody in the promotional material indicated any of the following. The "walk" is along a dusty gritted pathway adjoining the road with lorries and cars -almost continuously passing at speeds around 40-50 mph(50-60 kph) took at least 12-15 minutes to the supermarket. Although you pay a surcharge for "service" -this was non existent no replies were forthcoming when we sought clarification at 9.00 pm non arrival at the site and it took us over 30 minutes in the dark -nobody around -reception closed -and appalling signage. If you go on holiday to rest then time your sleep patterns to ensure that you are awake for the bin collections -upon which you have a good view- clatter at 0300 hrs.Otherwise heavily sedate yourself. The owner did kindly let us stay for an extra 5hrs to coincide with transfer. Regrettably we will not recommend this facility. Lovely apartment in pleasant holiday complex. We very much enjoyed our time here - the apartment was lovely and airy, with a nice balcony that was cool for most of the morning. Pools etc are heavenly, though not entirely child friendly (my son was told off for jumping in which he was a bit miffed about). But generally a very nice complex. Tavira is about a half hour walk, plenty of good restaurants etc; pretty place and a good 'buzz'. We couldn't get the TV to work in the apartment, but perhaps that was us. Overall, I'd definitely go again. Wonderful apartment.Quiet, very clean.It has everything you need to be comfortable. We spent 3 wonderful days. No one single complain about the apartment. It was great!!. Clean, light and airy apartment, close to Tavira. Tavira Gardens is situated on a main road out of the town and a walk into the centre would probably take about 20 minutes. Tavira is an interesting, historic town with plenty of charm and is worth exploring. The apartment was clean, with a well equipped kitchen and was adequate for our needs. The information brochure left by Emma and Sergio was helpful and gave us good ideas for restaurants and things to do. Emma’s instructions for reaching the property, collecting the key etc were very clear and the tone of her messages was friendly (we didn’t meet anyone acting in a caretaker’s capacity, since we had no problems). I would say that the apartment would be well suited to a young family or a group of young people sharing. For my husband and I it was a good base for exploring the surrounding area by car. If I may make a suggestion: a security light on the external stairs at night would have been welcome. wonderful restaurants close by and supermarkets within 10 minutes walk. Tavern town was wonderful, numerous churches and a castle, good shops. Thank you very much for the great review Simon, we're glad you enjoyed our apartment and the area as much as we do! A great property, everything you could want in a vacation home. We really enjoyed our stay, the apartment was clean, quiet and well equipped. Close to everything in Tavira. Would highly recommend this property. Tavira is situated in the Ria Formosa Nature Reserve and is famous for being one of the best 'unspoilt' areas of the Algarve. The town has beautiful architecture, historic sites, many old churches and art galleries. The area is also a 'Hotspot 'for bird watching. There are lots of good bars and restaurants which cater for most tastes, as well as a nightclub on the outskirts of the town. Bikes can be hired in the town centre. During the summer months there is free live entertainment most evenings in the vibrant, picturesque, town square. The beach boasts 18km of golden sand with popular water sports available as well as showers, restaurants and bars. There are three Golf Courses within 5 mins drive of Tavira Garden. A new shopping centre is currently being built and will be completed by 2009 in the meantime there is a large shopping centre in Faro (25 mins drive). Spain is only 20mins to the East & the beautiful Seville 2 hours drive away.